Bynx is a stray cat that decided (on his own!) to visit us here at TLC and followed a client through our front door! He was obviously not afraid of people and started purring as soon as he was picked up. We could tell someone had been feeding and caring for him since he was in good condition and tried to find his home. Meanwhile; Bynx became somewhat of a “clinic cat” and was content to explore both inside and outside the clinic! When he was ready to come back inside he would either follow someone through the front door or scratch at the back door to be let in. Although we all enjoyed having Bynx as our clinic cat for a while; it was not fair to him to have to be confined in a cage during the night. He was not shy about sharing his displeasure with us first thing in the morning and demanded to be let out of “confinement”. After several weeks as a clinic cat and nobody claiming him as their own; Bynx was adopted out to a client looking for a companion. 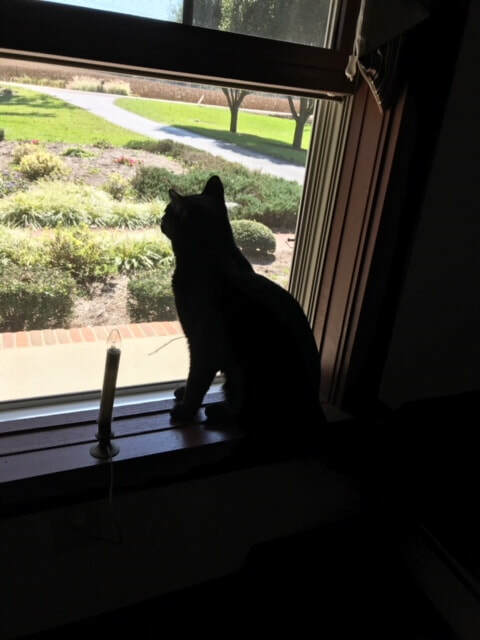 Bynx is now settled into his new home and has claimed the window overlooking the front yard as his! Taking his first “official duty” seriously, he keeps a look out for any early Trick or Treaters!